Facing the loss of a major employer, the city of Salinas embarked upon a new mission to harness its strengths in agriculture and proximity to Silicon Valley to create an AgTech Innovation Ecosystem — a bold task in a largely low-income farming region that once had little to no existing startup culture. This highly impactful initiative has changed the city’s trajectory and won the International Economic Development Council’s Gold Award for Entrepreneurship. Salinas, California, once had two claims to fame: as “the salad bowl of the world” and as the birthplace of iconic American author John Stein- beck. 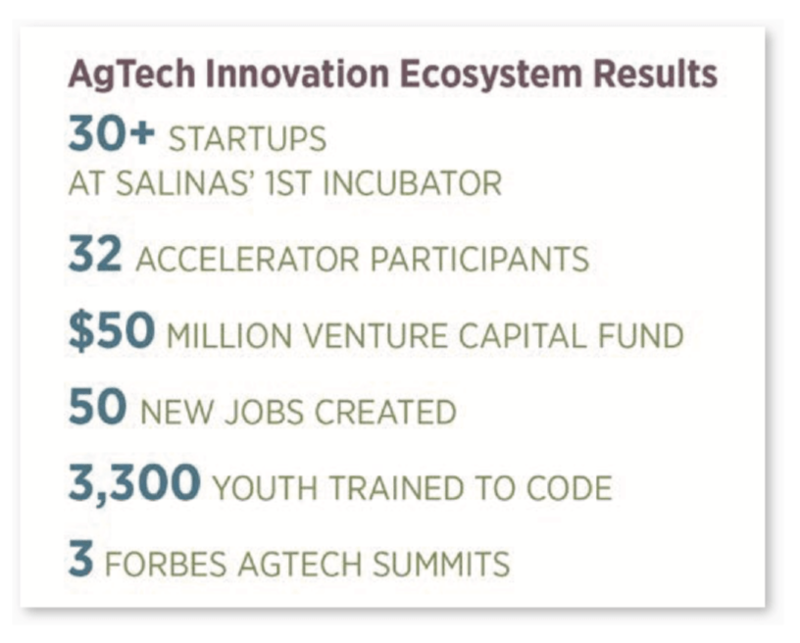 While these will always be part of Salinas’ identity, in recent years, the city has embarked upon a new mission to harness the region’s agricultural prowess and proximity to Silicon Valley to create an AgTech (agriculture technology) Innovation Ecosystem. The ecosystem, which received an IEDC Gold Award for Excellence in Economic Development in 2017, focuses on entrepreneurial development, workforce training and marketing in the AgTech industry – a bold task in a largely low-income farming region that once had little to no existing startup culture. This article explains how the city created its AgTech Innovation Ecosystem, what spurred it, how it works, and the successes and lessons learned. Located in Monterey County on California’s Central Coast and just 60 miles from Silicon Valley, the city of Salinas (pop. 157,380) serves as the region’s economic hub. Home to some of the richest farmland in the United States, the Salinas Valley boasts an $8 billion agriculture industry and is the world’s largest producer of lettuce, as well as a top producer of strawberries, broccoli, wine grapes, and other fresh produce. The region is home to agricultural giants such as Driscoll’s, Dole, Taylor Farms, Tanimura & Antle, and Earthbound Farm, to name a few. Despite its stature as an agricultural powerhouse, Salinas faces many challenges. Educational attainment is low: only 60 percent of the city’s popula- tion has a high school diploma, and just 12 percent achieve a Bachelor’s degree or higher. The community has a large immigrant population: 75 percent of the population is Hispanic or Latino, with 68 percent speaking a language other than English in the home. Additionally, more than 30 percent of Salinas’ population is under the age of 18, and the city has lost many of its young residents to the in uence of criminal gangs. Furthermore, due to the seasonality of the agriculture industry, Salinas’ unemployment rate often exceeds 10 percent in the winter. In 2012, one of the city’s largest non-agricultural employers, Capital One, announced it was closing its doors in Salinas due to a company acquisition. Salinas would lose 869 of some of its best jobs, along with an unknown number of indirect losses. In response, the city of Salinas convened a group of local stakeholders to identify steps to mitigate the loss of these positions and identify a strategy that would promote the city’s long-term economic health. From this group came the plan to leverage the city’s geographic location near Silicon Valley, local industry, and other resources to develop an ecosystem for the AgTech industry. While it was a local crisis that spurred this initiative, the timing was right based on trends already happening in the industry. Farmers in the Salinas Valley and around the world were already beginning to incorporate more and more technology into their businesses – ranging from automation, to drones, to sensors in the elds. The industry as a whole was changing as farmers recognized that technology could help them solve challenges surrounding labor, sustainability, water, food safety, and growing demands for food as the United Nations estimates that farmers will have to produce 70 percent more food by 2050 in order to feed the world’s growing population. Andrew Myrick, CEcD, EDFP, has worked with the city of Salinas for more than 10 years. Most recently, he has focused primarily on the develop- ment of an AgTech Innovation Ecosystem within the Salinas Valley. Rachel Deloffre is an Account Director at Development Counsellors International (DCI). DCI specializes in economic development and tour- ism marketing and has worked for more than 450 cities, regions, states, provinces, and countries since 1960.